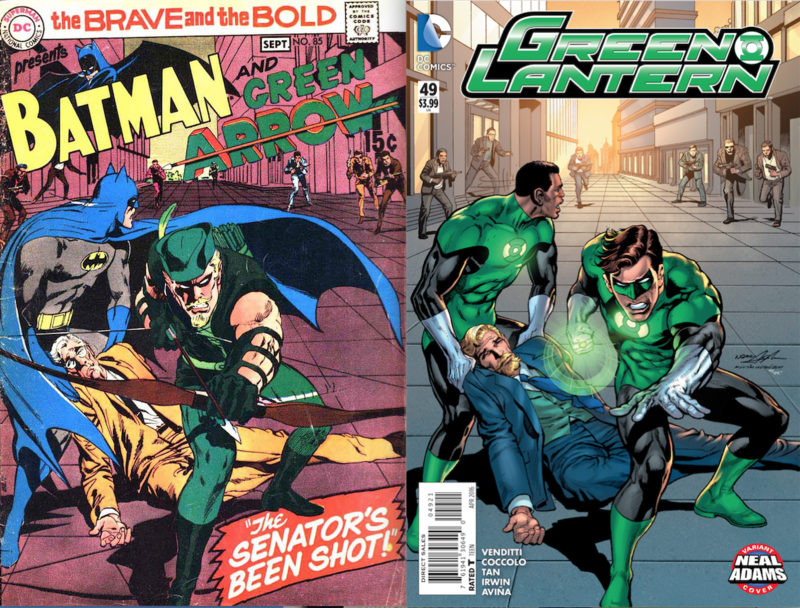 EXCLUSIVE COMMENTARY: Adams had a lot on his mind when he re-did the classic cover to Brave and the Bold #85. 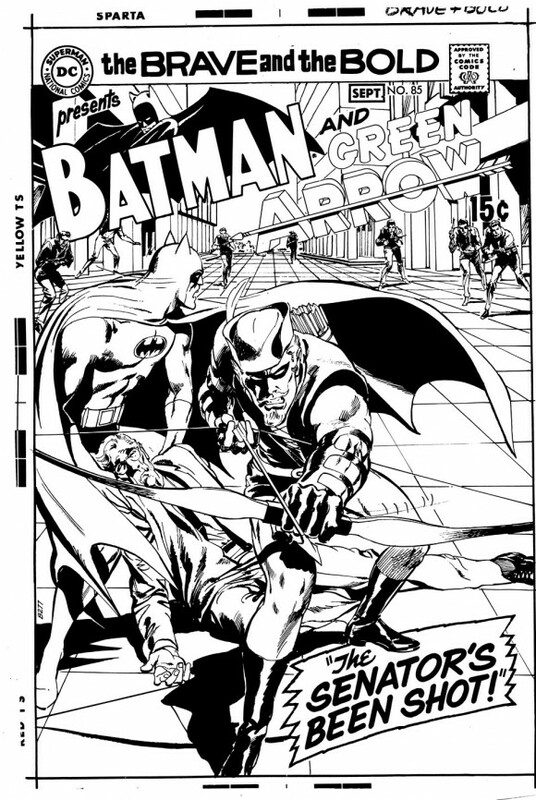 It’s NEAL ADAMS MONTH here at 13th Dimension, and we’re featuring daily commentary by Adams on his variant-cover project for DC Comics. Each of his 27 variants is a twist on one of his famous covers from the past. 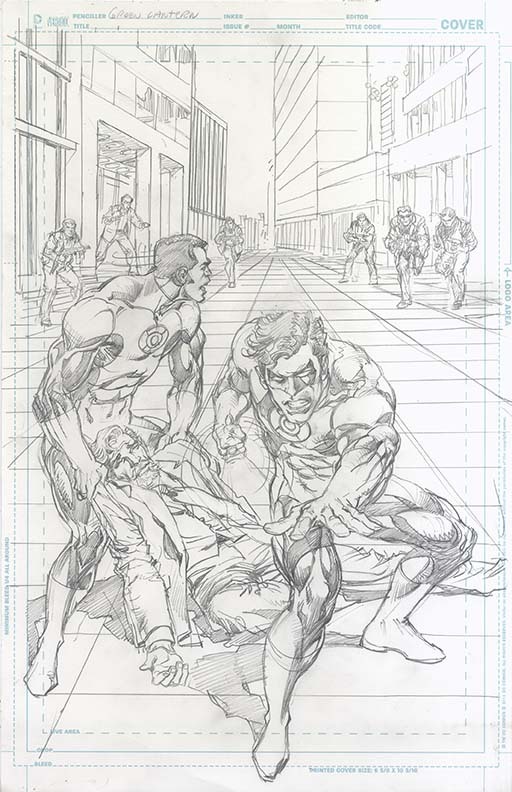 He provided the pencils, and the inks and colors were handled by some of the biggest names in the business like P. Craig Russell and Frank Miller. For yesterday’s segment, on The Brave and the Bold #84/Action Comics #49, click here. Now, to Green Lantern #49, out now. It’s based on The Brave and the Bold #85. Dan: … with the first time you see the modern, classic version of Green Arrow. 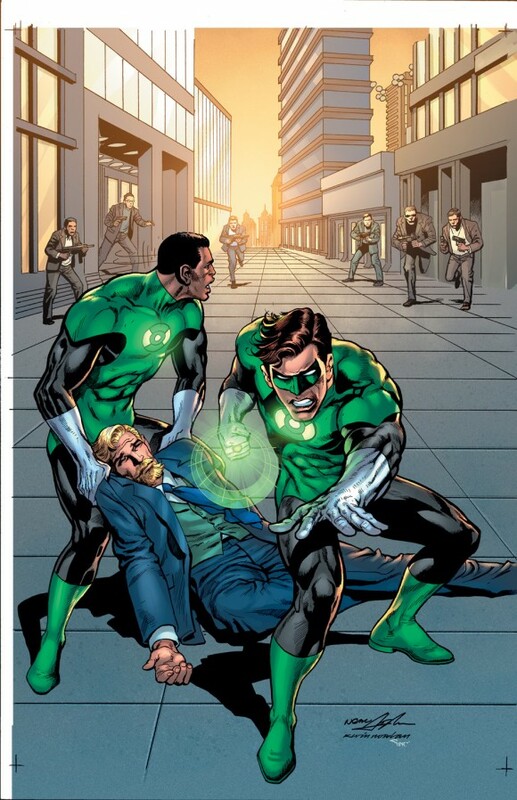 So you mix this up by having John Stewart in the Batman position, Hal Jordan in the main position and then you have Ollie as the one who’s been shot with all these other guys. Neal: He became the senator. GA just two years earlier. 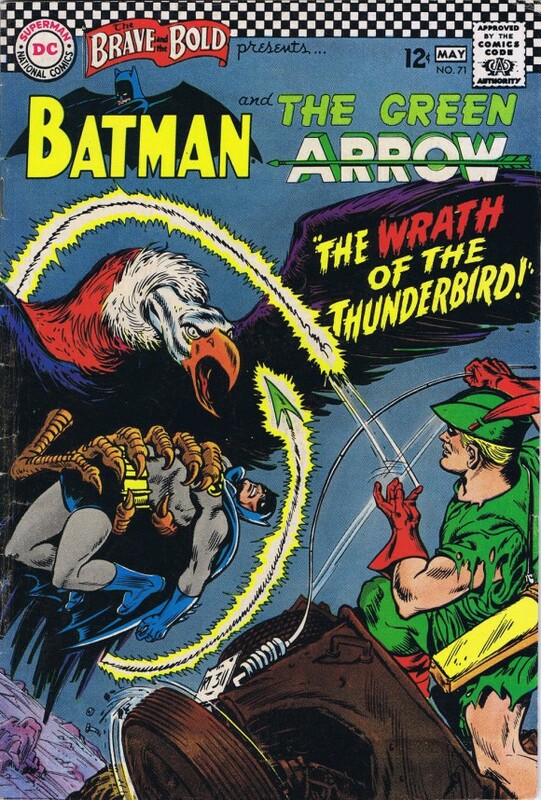 Cover by Carmine Infantino and Charles Cuidera. Now, the idea was, not to change the character because I see that done all the time and it’s the same character. The idea was to misdirect the audience… There weren’t that many people that gave a damn about Green Arrow. … He was a takeoff of Batman but nobody cared. It wasn’t like anybody said, “Oh, let’s think about this.” Nobody thought about it. So if I make him a modern-day Robin Hood and use Robin Hood as my touchstone, nobody will think about Batman. And that was the goal. That was the whole idea, here. So that’s what I did. In the story … I made him the foil. John Stewart is the first black superhero who is a college graduate and has a profession. … I wanted to get him on that cover to take the place of Batman who I consider to be the paramount character at DC Comics. So here was the perfect opportunity to just rotate that little turntable and put him onto a prominent position on there to remind everybody that John Stewart — Hal Jordan may be the greatest Green Lantern of all and we still need to save him a little bit — but John Stewart is the next one. Not anybody else. Dan: Last week, when they did a TV show that was promoting their slate of movies, they strongly implied that the next Green Lantern movie is going to be about Hal Jordan and John Stewart. The Green Lantern Corps. My favorite part of this interview, Dan Greenfield, was the end: “Neal: I can tell you on a personal basis—and you can put this out there: I’ve had grown men stand in front of me—black men—stand in front of me and cry. And I’m not talking about one guy. I’m talking about easily half a dozen guys. Because they choke up. Because they’ve never had a character like this.” I can vouch for that; when I gave a talk at Barnes & Noble in NYC in ’04 about my Silver Age book, a black man stood up at the end and said that he had grown up in the ghetto, but became a successful actor because of the inspiration he got from John Stewart! Dan, hey there. Great chat with Neal. I had a chance to chat with him at New York Comic Con a few years back. It’s quite clear that John Stewart is one of the creations he most proud of. He went into the clearest detail of how he and Denny O’Neil went to their GL editor and demanded that the book create a backup Green Lantern who wasn’t “just another white guy” (e.g. Guy Gardner who was the already-established backup). Adams said, The power ring can soar around the world and find any person who has no fear and is a person of integrity — and it just so happens that it would always pick white guys on Earth? That was the genesis of creating John Stewart. Considering how far behind Marvel was in having black heroes (like, NONE), good for Neal and Denny.shaking things up — even if he was, at the time, a backup!